Today I did my second free service at 10000 Km. Good thing is that, all parts are identical to that of Duster. So service cost is similar. Total cost of consumables was around 3000 Rs. So far, I am happy with Captur for it is a fun to drive car. But, I do miss features like dead pedal & Apple car play. Great review! A few observations from my side, being an ex-Lodgy owner. Sir, your views and observations are certainly very useful.. one needs to practically drive and test to understand these things. But, regarding the reliability of 110ps, arent enough vehicles been sold already with these engines in our country and abroad, that by now it should have been clear on this issue ? Thanks ! Renault is expected to launch a CVT variant of Captur by July, got this information from reliable sources. This sounds a great news! I am serious about this vehicle ! How authentic could this info be, Sir ? This was told to me by a person handling sales in April, but seeing current sales of Captur Renault may bring in new Duster. Just returned from a trip to Uk and Europe. Captur is very popular there. Don't know why it flopped in India. Discount still available on 2017 playtime and RXT dual tone variant. This topic has been discussed many times. 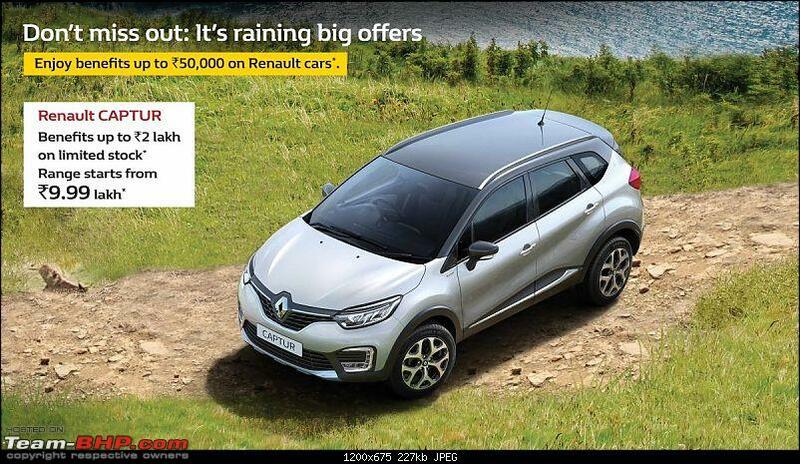 The Euro version of Captur is on Clio platform while Indian Captur is based on Duster platform. The difference is huge between the two. Discount still available on 2017 playtime and RXT dual tone variant. Limited offer up to ₹200,000 on select variants manufactured in 2017. Offer applicable to limited stock only. But, what about Kaptur in Russia and Captur in Brazil? I think they are doing well in home countries, even though based on Duster platform. I think Indians prefer SUV looks over crossover styling. The Captur is being offered at hefty discounts of upto 2L now. Not sure, but it might be a steal for some ! The Captur is being offered at hefty discounts of upto 2L now. ! 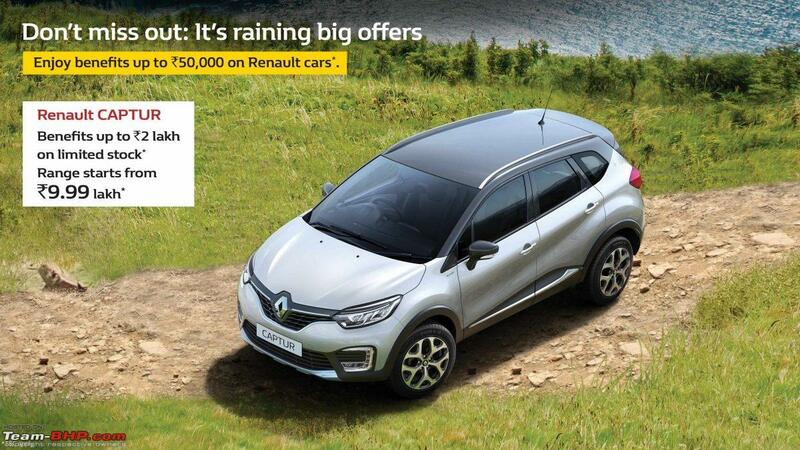 Probably that may mean Renault may stop selling Captur and clearing their inventory? Similar discounts were given on Fluence some years back, especially for those cars lying in factory warehouses for more than a year or so. I checked with the dealer here in Mumbai- they have one specific variant only in stock which they want to clear and hence offering discounts of around 2L. The advertisements said starting at 9.99 lakhs, so not sure how they got the pricing wrong cause 9.99 is good value for the *premium* SUV. If you ask me, they got it wrong by not offering an automatic, 4WD and better interiors/dashboard etc.. The exterior design is very good, the interiors are a total let down. I couldn't agree more. It's extremely stylish from outside but has nothing much going on inside. It's still a few ages behind Ford and Hyundai. The big miss is the automatic. I see so many ownership/booking reports of Ecosport AT and Creta AT on team bhp. In fact, overall there seems to be a definite shift towards automatics in the last year or so at least in metro towns. Renault with a sparse network should have first targeted the urban city dwellers with an auto option. Trailed a Captur around Ooty last weekend and was impressed by the body control around the twisties. Looked even more capable than the Duster in my opinion. This was the top-end model and the front looked smashing with those LEDs. What a shame we aren't seeing more on the roads!